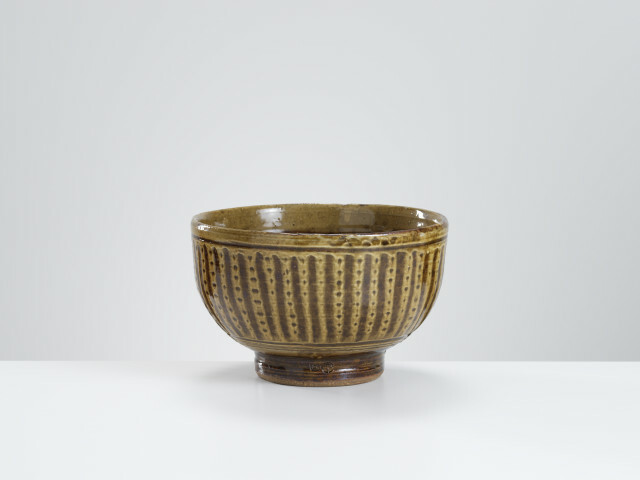 Michael Cardew (1901-1983) was the modern potter most successful in revitalising the British slipware tradition, infusing it with a twentieth century artistic sensibility, but almost uniquely amongst today’s potters, with no loss of vitality. Cardew trained with Bernard Leach in St Ives, and in 1926 he re-established the old pottery at Winchcombe, Gloucestershire to pursue his passion for earthenware. Over the next 13 years he made fine tablewares and individual pieces which had great depth of glazing and trailing. His fluidly executed motifs across often iridescent surfaces were continued in stoneware after he moved to Wenford Bridge in Cornwall. However Cardew, an inveterate traveller, also spent long periods teaching and potting in west Africa in the second half of his life. The best of the later work, particularly that made at Vumé and Abuja, preserved many of the qualities of his early slipware, a warmth and generosity of spirit that said as much about its maker and his considerable influence, not only as a potter, but as prolific writer, teacher and polemicist.